It has been two years since Jog Bahadur went t o work in the holy Indian lake at Gaurikunda. Carrying provisions didn't earn him much, but if he got to ferry fat Lucknow or Kanpur businessmen or their wives on his back to Kedarnath temple, he could make up to Rs 25,000 a season. He couldn't go last year be because his mother died. This year, the Maoists have told him he can't go to India because he has to vote in forthcoming elections for the constituent assembly. So this year, there is no money, no work and Jog Bahadur has come down to Surkhet after promising the Maoists cadre in his village that he would return immediately if the constiuent assembly elections are announced. But with the money he earns here, he can barely feed himself and there is no question of being able to send money home to his family. So he is trying to go down to Nepalganj. But Gaurikunda is out of the question. "If the Maoist brothers find out I went to India, they'll give my family a hard time," he tells us. the terraces around his house in Dailekh. From his grandfather's time, the head of his household has been called Sisne. Jog Bahadur's father was a waiter in Kurla outside Bombay. Jog Bahadur himself attended primary school and lived there for seven years. After his father's death in a car accident, Jog Bahadur's uncle brought him home. He forgot the letters he learnt, can't read anymore and his memories of Bombay are now blurred. If he knew what his home village had in store, perhaps young Jog Bahadur wouldn't have returned to Nepal. But, as fate would have it, he did. "The brothers will want me to go back if the elections are held," says Jog Bahadur, "but it doesn't look likely now. Earlier there were rumours the constitutional elections would be held within two months. If the war starts again, all the boys and girls in the village will go back to the jungle." And that is what worries Jog Bahadur, because his own son, Ganesh, is hobnobbing with the Maoists. "It's really just the fear that he will get killed. The government won't let him off, and the Maoists will kill him if he disobeys them. That is what is so worrying, and Ganesh's mother just can't live with the fear." "Except for their murder, they are all right," says Jog Bahadur, "they encourage children to go to school, they discourage drinking, they seem all right otherwise." Recently, they told Jog Bahadur not to carry out the saraddha ceremony for his dead father, and that sent a chill up his spine. Jog Bahadur has always tried to fulfil his ancestral obligations even when times were tough, and when the Maoists order him to abandon this tradition he is disturbed. So we ask him why the Maoists think the constituent assembly elections are so important. "Well, they say that if we have our own constitution the people themselves will be in charge, no one will be able to order us around. There will be jobs and life will be much better than it is now." 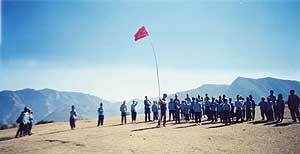 The Maoists even proposed to make Jog Bahadur a member of the local 'peoples government'. "But that was absurd," he chuckles, "imagine someone illiterate like me being in government. I laughed it off, but Ganesh's mother is afraid. One of her cousins in Jajarkot was in the local peoples government, and he was killed in the fighting. She has been shaken ever since." Jog Bahadur doesn't really own much property. His small patch of terrace supports the family for about seven months, and there is really not much else do but migrate to work for the rest of the time. His strides have taken him no further than Gaurikunda in search of work. His uncle works in Joshimath in India, and has now moved his whole family there. Jog Bahadur doesn't want to move out, but doubts if there is much hope for survival in his home village in Dailekh. Aside from concern about survival, Jog Bahadur's mind is constantly occupied with worries about his youngest son who is sick. His wife is too ill to work, and one of his daughters is now getting old enough to marry. He is anxious since the Maoist brothers are now ranting on about the possibility of going back to fighting if the government doesn't agree to constituent assembly elections. Jog Bahadur doesn't think it is likely there will be elections, and he doesn't think the killings will stop so easily. Translated from the Nepali original in Himal Khabarpatrika by Indu Nepal.